Posted on April 19, 2014 by Lena K.
After the two main characters are introduced, we get to know a few more characters, such as Kina’s twin sister Kanana, some of her potential love interests, as well as Sumi and Kina’s new neighbors. Interestingly, all of the characters are lesbians, both main and side-characters. No exceptions. So, yeah. It feels a little weird, since this makes it look a little ridiculous, but for us yuri fans, this is, of course, a most welcomed setting. I mostly enjoyed each and every one of the girls, even though I feel like many of them were not properly introduced to us. 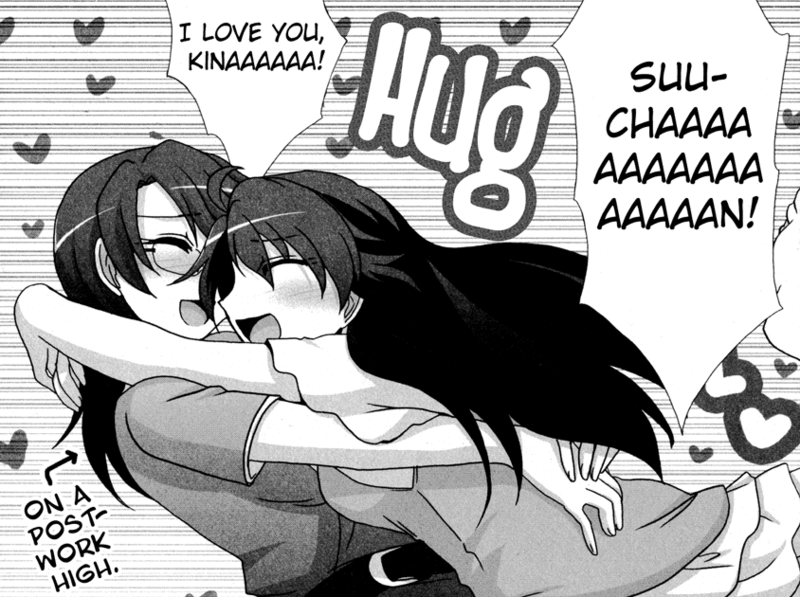 I also often caught myself hoping to just read about Sumi and Kina alone, instead of having loads of other characters around. You see, whenever the two are alone, they are just so cute together. Flirting with each other like there’s no tomorrow, and I simply don’t want others to interfere. The only thing that I probably didn’t enjoy is the dialects that the characters use. It would most likely feel a little different in Japanese, but since I read the English translation, it often sounded weird, at least to me. In some cases, their dialects even ruined some nice and heartwarming moments, but this luckily only happened once or twice, so it’s fine. All in all, Wife and Wife is a nice read, but nothing more. It has some nice comedy, cute yuri characters, and is just a very relaxing and fun story. However, if you’re looking for a hilarious manga, this might not be to your liking. Also, if you’re looking for a really romantic manga, then this is yet again might not be what you’re looking for. It’s a mix between romance and comedy, but it doesn’t take anything all that seriously. So I guess if you haven’t read Wife and Wife yet, and have nothing better to do, then why not give this one a try? It might not be the best yuri you’ve ever read, but it’s a nice read nevertheless. 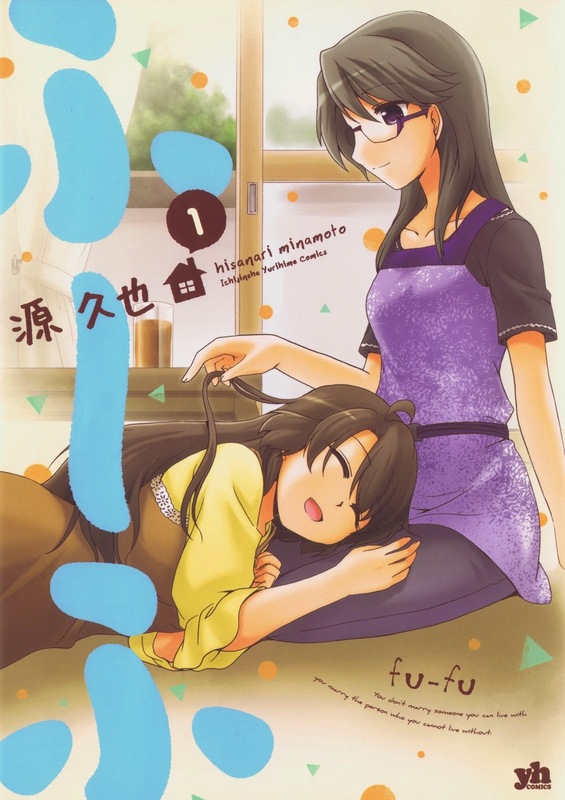 This entry was posted in Manga, Manga Review, Yuri and tagged Fu-fu, Minamoto Hisanari, Wife and Wife by Lena K.. Bookmark the permalink. Wife and Wife brought me nothing but joy and unlimited happiness. An anime adaptation of this would be a godsend, but it already ended so it's unlikely. Oh well…we'll always have the memories. This would really make a great anime, but I'd be ok with an OVA as well. I don't even need to see all the other characters, they should just focus on Kina and Sumi. Gotta try this one. Just seeing the title already gives me some really nice feeling..^-^ I'm so, so, so glad I've found your blog! Thanks for the nice reviews! You are most welcome! You're doing a great job here so you deserved it! 😉 Just finished re-reading Girl Friends yesterday so im'ma start reading this now. Thanks again! If I remember correctly, both, Sumi and Kina speak with a dialect, but since I'm not a native English speaker, I can't really tell what dialect it is. Sumi speaks with a dialect? I thought she speaks just fine. I guess I have to reread it, huh? Well, I could be wrong too. In this manga a lot of characters speak with a dialect, so i guess I just assumed that Sumi does so too. I really enjoyed this one is there any other good ones like this where they are already in a relationship? What you're looking for is kind of rare. The only manga that comes to mind would be “Dandelion among Lilies”, but it's a very different genre then Wife and Wife. If you're only looking for works in which the characters are already a couple, I'd just recommend you to read doujinshi, because in those this is far more common. Ok. I'm beginning to reread the manga and had noticed something. In the bonus chapter where Sumi and Kina first met, I realized that Sumi had just transferred and couldn't understand any dialect from anyone, including Kina. Not sure where Sumi actually transferred from, but maybe that's the reason why Sumi is probably the only one who doesn't speak any dialect. I think is one of my favorite Manga that you've recommended so far. 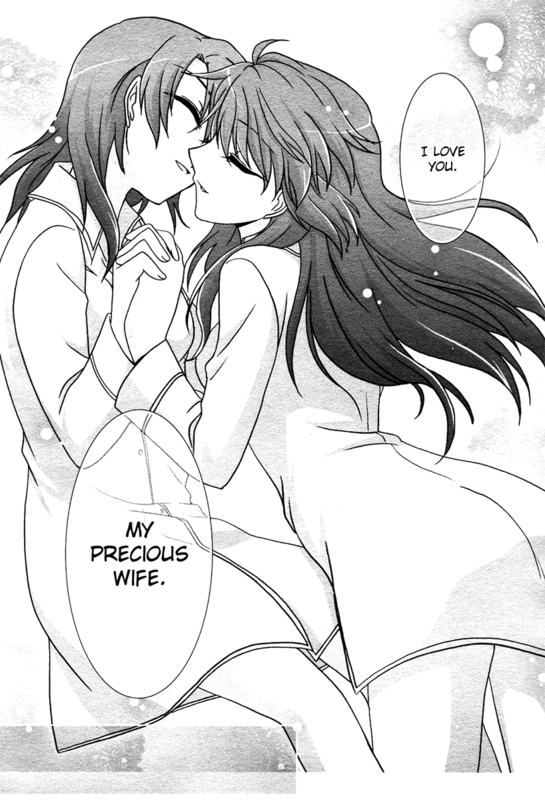 I should say that Wife and Wife is my second manga after Tama to Tama to… And i've readed so many manga after that but nono of them even got to fu~fu's heel… Really, this is and always be my favorite manga! These are the reasons: no men, all characters are in girls, i love the comedy/romance part, i love the art! You're right! Sometimes, there will be a verry good anime that resembles wife and wife in a better way, with more yuri love-love no male character! For the people wondering what dialect they were speaking. It was a southern accent. It was probably an Osakan accent in the original Japanese.